We were recently asked to install a Solidor composite door in a property in West Yorkshire. Mr. Thomson wanted to replace his property’s uPVC front door with a high security composite door, and approached Alpine Glass in order to help them find the right product for his home. 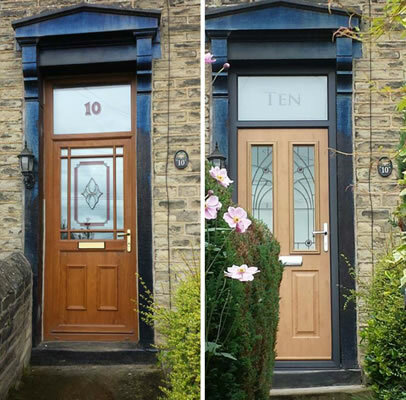 Originally, the property had a timber look front door – made of uPVC but with a wood effect foil. The door had begun to look dated, as well as losing its energy performance. As well as improving his home’s energy efficiency, Mr Thomson wanted an ultra secure entrance to his property. We recommended a Solidor composite door, which is renowned for its high thermal insulation and security. Solidor composite doors are made from a durable slab of high performance timber that provides incredible strength and durability, making it resistant to even the most sustained of attacks. You can see how tough they are in this video! They also utilise high density foam and a thick GRP skin that provides good all round thermal retention, keeping a property warmer for longer. We arranged a design consultation to discuss styles, colours, glass, accessories and more. Mr Thomson wanted the door to look similar to his existing door, but with a new, modern design. He also wanted a new glazed ‘top light’ above the door, personalised for his house at number 10. Mr Thomson’s new composite door was a Ludlow style Solidor in Irish Oak, with a Jewel style glass design and a Tube style handle in chrome. Fitting the new Solidor composite door presented no challenge to Alpine Glass installer Andrew. 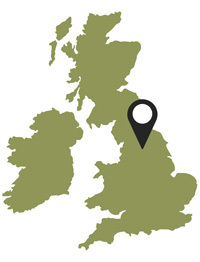 Having served the West Yorkshire area for nearly 10 years, he knows a thing or two about installing composite doors! The job was completed in a matter of hours in August 2015, and Mr Thomson was extremely happy with the quality of his new front door. Like all Alpine Glass installers, Andrew is a fully qualified and professional fitter who takes pride in every job. As a double glazing company, we’re also FENSA registered and offer a 10 year Insurance Backed Guarantee with every single installation. Find out more about Solidor composite doors from Alpine Glass by giving us a call on 01274 49 49 40 or by sending us an email. As well as a personal design service, we also have an online door design tool – with all possible Solidor combinations!